If you read the news, you’ve probably heard of the retail apocalypse. As the world of shopping shifts online, brick-and-mortar stores are struggling to keep up and convince customers to come inside. In fact, it’s believed that close to 75,000 stores that sell clothing, furniture, and electronics are expected to close up shop by 2026. But your business doesn’t have to meet the same fate. There are ways to boost foot traffic, attract customers to your store, and avoid the retail apocalypse. Need some tips on bringing people into your business? Here are 11 tips on how to improve your retail storefront, so you can convince customers to come inside and start buying. If your business is located in a mall or destination with a ton of foot traffic, you already have a giant potential audience. You simply need a way to capture their attention and bring them over to your store. You can achieve this with a great display window that tells your brand’s story in a way that piques a customer’s curiosity and encourages impulse buying. Not sure how to create a great display window? Use bold shapes and vibrant colors to capture the attention of customers. Showcase products or sales offerings but be sure to keep things clean as clutter will drive customers away. If you're struggling with your signage, here's more information on how to create a great one. In-store events are a fantastic way to bring customers inside your store. If you want, host entertainment or offer light bites for customers as they peruse your shop. Walk them through any new offerings you have and entice them to buy by offering exclusive in-store event deals. Talk to your employees about what kind of event they think would entice customers most. Then ask customers if there is anything they’d want from an event. Just make sure you plan in advance and invest more money then you’ll ultimately get out of it. Do your products offer training or expertise to properly use? If so, think about hosting a seminar or website that shows customers how they can make the most of your products. You can host product demos or educational seminars. Anything you can do to establish your company as an expert and trusted resource customers can depend on. Business isn’t just about bringing new customers in, it’s about keeping your existing ones coming back for more. And by investing in your existing customers, you can encourage the established foot traffic you already have. Reach out to customers over social media and email to recapture their attention. Offer a thank-you discount for their previous shopping or inform them of any new products or services you now offer. You can also offer a referral bonus or discount for customers to encourage them to recruit new customers. A great way to engage with potential customers is to identify who they actually are. Stand outside your shop and look at who walks by and looks inside. See where they come from and go to next to understand who your audience is, and if it differs from how you advertise. By paying attention to your customers, you can better adjust your storefront materials to match that demographic. Sometimes customers don’t come to stores simply because they don’t know they exist. A great way to address this issue and encourage foot traffic is by using location-based apps. Many apps like Groupon and FourSquare let you post about your limited-time deals to customers within a certain distance range. This can help you target customers who are so close they can’t help but come into your store and buy. Free Wi-Fi is a great way to attract bored customers or people who are open to shopping at your store but may not normally come in on their own. It’s a great strategy; in fact, 62% of businesses report that customers spend more time in their store after they started offering free Wi-Fi. Another great way to bring customers in? Offer free USB charges. Customers love free charging stations, and shopping around your store will give them something to do as their phone charges. Believe it or not, but a store being pet-friendly can be a great motivator for customers to come in. And all you really need to do that is to put out a water bowl, offer some treats, and have some doggy bags on hand in case of any messes. Making pets welcome is a great way of making your customers feel even more welcome, and this strategy is especially great for businesses in public markets or outdoor spaces. Providing discounts for customers who check-in to your store on social apps is a great way to encourage them to visit your store. It also alerts other potential customers that people are shopping at your store. And once they’re there, offer exclusive in-store perks for people who buy in the store. Do you have a bigger marketing budget? Why not partner with a celebrity or influencer as a way to attract customers to your stores. This chance to meet celebrities is something many customers can’t pass up, and they’ll be more likely to buy because of it. And the buzz around it can also help drive more traffic to your website. This strategy is great for retailers who work in the athletic gear or wellness space, but it is something any store can try out. Organize things like run clubs or partner with a local yoga studio to get potential customers engaged and motivated. Not only will you get them moving, but you’ll get them to think of you as more than just a store. 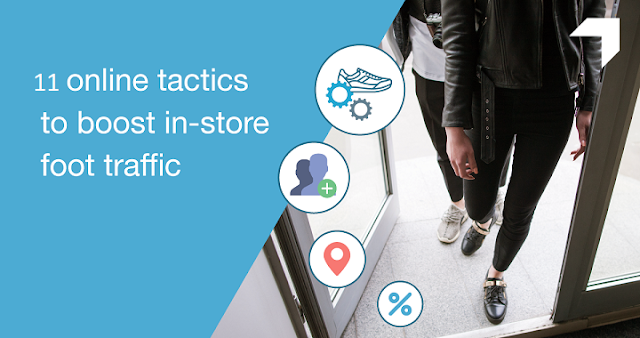 Ready to Up Your In-Store Strategy? Retail isn't dying because of the Internet, but it is requiring stores to evolve to keep up. By trying out these 11 tips, you can increase foot traffic to your store and attract more customers. Are you in need of marketing advice or assistance? Check out our services to see how we can make your business profitable!